JP Concerts is proud to present STRINGS THEORY TRIO. Combining idiomatic flexibility, a deep wellspring of creativity, and world-class virtuosity, violinist Mimi Rabson is one of the Boston area’s most valuable musical resources — and her new recording with her Strings Theory Trio is a uniquely compelling synthesis of classical chamber music and directed improvisation, bringing together some of Rabson's most important influences and inspirations. With Rabson and Helen Sherrah-Davies on five string violins and Junko Fujiwara on cello, the String Theory Trio supercharges the intimate atmosphere of chamber music with a triple dose of edgy, daring improvisation. The listener is treated to experiencing Western classical tradition anew; the surging counterpoint and crystalline instrumental sonorities gain new resilience and allure from their origin in the inspiration of the moment. 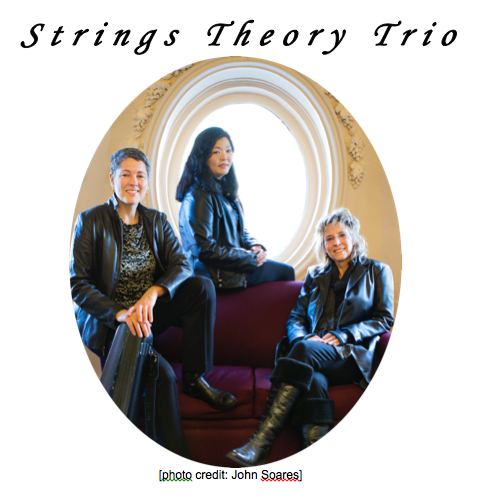 Simultaneously delicate and dangerous, the Strings Theory Trio’s music is richly nuanced and deeply satisfying.